Iran and North Korea are growing their stockpile of ballistic missiles, including long-range missiles capable of striking U.S. assets, American allies, and even the continental United States, according to new congressional reports that shine a light on efforts by these rogue nations to advance their military capabilities. North Korea continues to aid Iran with its advanced ballistic missiles program in defiance of international regulations barring such activity, according to the reports, issued by the Congressional Research Service. This includes an extensive proliferation network and multiple facilities dedicated to constructing short-range, medium-range, and long-range ballistic missiles. Iran's missiles, many of which are modeled off North Korean technology, are advanced enough to strike targets throughout the Middle East, including Israel, stoking fears that the next regional war—which many say is imminent—could present Iran an opportunity to show off its newest missile technology. U.S. officials familiar with the Iranian and North Korean missile programs told the Washington Free Beacon that much of the recent technological progress by these rogue nations is the result of the Obama administration's efforts to relax international regulations on such activity as part of the landmark nuclear agreement. In the time since that agreement was reached, Iran has taken significant steps toward building, testing, and improving its ballistic missile technology, including long-range missiles that have been tested under cover of Tehran's space program. "The Obama administration gutted the international prohibitions against Iran's ballistic missile development," one U.S. official involved in efforts aimed at rolling back Iran told the Free Beacon on background. "Then, when Iran started racing to build a more sophisticated arsenal, they had Samantha Power make some noise at the United Nations before quietly standing aside. That's how we find ourselves where we are." The latest reports on Iranian and North Korean missile technology paint a startling portrait of the sheer power of both countries, which continue to exchange technology on both the missile and nuclear front. "Iran continues to invest in developing ballistic missiles and in building an extensive network of facilities, although missile inventory information is scarce," the latest report on Iran states. "Iran's short- and medium-range ballistic missile tests indicate that Iran is focused on increasing the accuracy of its missiles," according to the report, which includes both open source and U.S. intelligence community information. However, Iran continues to experience delays in its more sophisticated missiles, including its long-range and intercontinental ballistic missile technology, though it continues to test and refine this hardware. "The majority of Iran's heavy artillery rockets and ballistic missiles are tactical or short-range (less than 500 kilometers)," according to the report. The mobile nature of Iran's shorter-range rockets has allowed it to share this technology with its allies in the region. Shorter-range missiles employed by Iran are more than capable of striking "U.S. and allied bases in the Gulf region if moved from their operating bases, as well as targets throughout Iraq," the report notes. After years of testing and refining this technology, "Iran has grown increasingly self-sufficient in producing SRBMs [short-range ballistic missiles], but still probably relies on outside sources, such as North Korea, for some key components and material," according to the report. Iran also has developed and produced medium-range ballistic missiles (MRBMs) estimates to reach distances of around 2,000 kilometers or more, "sufficient to strike targets throughout the Middle East." "Iran continues to develop, test, and build more capable and increasingly accurate MRBMs," U.S. intelligence sources have noted. "Iran argues these missiles constitute an important deterrent and retaliatory force against U.S. and other forces in the region in the event of war." To support this missile program, Iran has built and underground network of facilities and missile launch sites that are protected by the country's air defenses and technology such as Russia's S-300 anti-aircraft missiles, which are currently believed to be operational. This would protect Iran's missile technology from a preemptive strike. 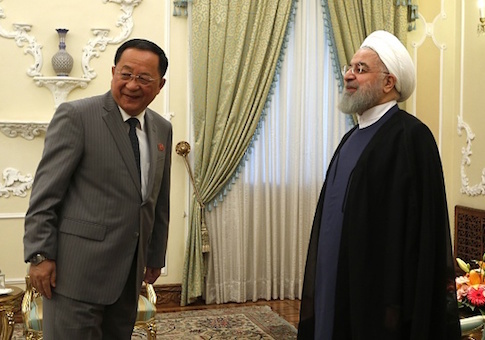 Support for Iran's program comes from North Korea and other rogue exporters that have skirted international sanctions and capitalized on the subsequent lifting of these sanctions by the Obama administration. "Iran relies to some extent on others, particularly North Korea, for certain key missile components and materials in its MRBM program," the report states. "Export controls and sanctions have made it increasingly difficult, but not impossible, for Iran to acquire the best of such items, causing Iran to try to exploit weaknesses in existing export and nonproliferation regimes, or to try to find foreign sellers willing to circumvent those laws." Iran's Shahbab-3 ballistic missile, for instance, has been imported from North Korea and is based on that country's own designs. Tehran's long-range and intercontinental ballistic missile technology is harder to pin down. "Some have long believed Iran's space launch program could mask the development of an intercontinental ballistic missile (ICBM) with ranges in excess of 5,500 km that could threaten targets throughout Europe, and even the United States (at least 10,000 km)," according to the report. However, it remains unclear just how much progress Tehran has made in developing working technology. Meanwhile, "North Korea has made rapid advancements in its nuclear weapons and ballistic missile programs," according to a second congressional report. "North Korea is striving to build a credible regional nuclear war fighting capability that might evade regional ballistic missile defenses." As the United States pursues diplomacy with North Korea, there are encouraging signs the country has made moves to dismantle some of this technology, the report notes. This entry was posted in National Security and tagged Iran, North Korea. Bookmark the permalink.